This Memorial Day, The National WWII Museum in New Orleans will commemorate the men and women who made the ultimate sacrifice in the fight to preserve our freedom. 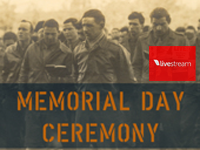 If you can't make it to the museum, you can watch a live broadcast of their Memorial Day ceremony this Monday, May 25, from 12:00 noon to 1:00 pm EDT on Roku's Livestream channel. More information on this event can be found on this Livestream event page. Click here for more information on the Livestream channel, and click here for more of What's on Roku.